Back in June, Apple took the wraps off the newest Mac Pro, which got a cylindrical makeover whose shape and hue remind us of the monolith from 2001: A Space Odyssey. Aside from its resemblance to an iconic sci-fi movie entity, the Mac Pro will of course be stuffed with a new set of specs as well, aimed at power users including video editors, photographers, musicians and similar folk. When the new Mac Pro was initially announced, we learned that it would sport a 12-core Intel Xeon processor, PCI-Express based flash storage, dual AMD FirePro GPUs, and the ability to connect three 4K resolution monitors. Apple also dished on port selection details, which include Thunderbolt 2, USB 3.0, HDMI 1.4 and a pair of Gigabit Ethernet connectors. Wireless connectivity options will come in two flavors: 802.11ac and Bluetooth 4.0. Apple’s June Mac Pro presentation also taught us that the unit would be 9.9 inches tall and 6.6 inches thick, effectively attaining small form factor status. Despite all that Mac Pro details that Apple distributed at WWDC, there were numerous information gaps surrounding Cupertino’s newest desktop; namely detailed specs like the exact processor used, price, and release date. Apple lifted the veils on those three areas of interest today at an event held in San Francisco. So, here’s what we learned today about the new Mac Pro. The new Mac Pro will be powered by an 3.7GHz quad-core Xeon processor, 12GB of DRAM, dual FirePro D300 GPUs with 2GB of VRAM each and a 256GB SSD. All of this will run you a hefty sum of $2,999. For that cash, 256GB of storage is a bit light, and will quickly get filled up by professional photographers and other creative types. We also got exact numbers on the amount of Thunderbolt 2 ports and USB 3.0 connectors. 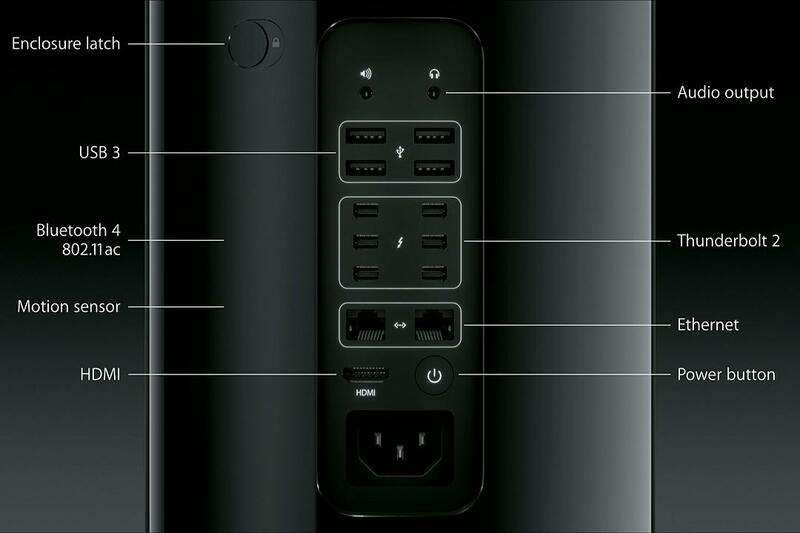 The new Mac Pro will sport six of the former and a foursome of the latter. Though Apple didn’t reveal an exact release date for the new Mac Pro, it will hit the market sometime in December.